Human Trafficking Intervention Prevention Strategy (H.I.P.S.) is a collaboration between agencies in Toronto to address domestic human trafficking. Chaired by East Metro Youth Services, this initiative ensures that the 20-plus agencies across the Greater Toronto Area can co-ordinate their activities to achieve a greater impact and build partnerships across sectors. It still exists. We experience it in the biases we hold that inform the decisions and judgements we make every day. Learn what you can do to erase these biases and make our city an inclusive and prosperous place for everyone. 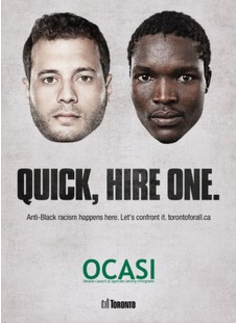 OCASI supports immigrant and refugee serving organizations in Ontario to address the mental health needs of clients through dialogue & collaboration, and in-person & online training for front line workers. Training is provided by Hong Fook, CCVT, and St. Michael’s Hospital. In the coming weeks, more details will be posted here. One year after Syrians began to arrive in Canada as part of a major resettlement movement, newcomer-serving and private sponsorship organizations take the opportunity to salute and thank the countless Canadians who individually and collectively contributed to sponsoring and welcoming refugees. Apply Now For Group Training! Are you funded by IRCC or MCI? OCASI is accepting applications for In-House Group Training under the Professional Education and Training Project (PET). Maximum funding is increased this year to $2,500, and must be spent before fiscal year end on March 31, 2017. Don’t miss this important opportunity. Apply today! The Welcome Ontario site has launched a new section called “Arabic Resources”. It has translated documents for newcomer Syrian Refugees such as Safe and Welcoming Schools, Information about Daily Life at School in Ontario and much more. Canadian Women’s Foundation is accepting proposals for Annual Violence Prevention Grants 2017 until February 6, 2017. Organizations can apply for two different types of grants: A. Rebuilding Lives, and B. Loan Funds. A new study by the Commission of Canada Mental Health (MHCC) submits convincing arguments on social and economic need to meet the special needs of immigrants, refugees and ethno-cultural and racialized groups (HST) and the populations racialized Canadian born.. The University of Ottawa Refugee Assistance Project (UORAP) and Community Legal Education Ontario (CLEO) have launched a new online tool for refugee support workers and others who assist refugee claimants in preparing for their hearing. CAMH is inviting applications for a new online course on the mental health needs and considerations for Syrian refugees. The course is free for settlement, social and health service providers across Canada. Next course session starts January 2017! Space is limited. The service, which will use text, chat and phone technology, will integrate and link existing regional distress and crisis line services across Canada. Once fully implemented in late 2017, it will ensure that individuals in crisis, regardless of where they live in Canada have access to free and confidential support, on a 24/7 basis.